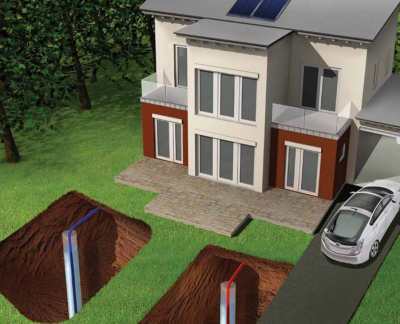 Here on the Delmarva Peninsula, the two standard geothermal systems installed are open loop and closed loop systems. Customers who are doing their research and trying to determine the system that will work best for their project are still sometimes left without enough factual answers or information to make an appropriate decision. We receive many calls regarding this question, so I will address each system in detail in the hope that we can clear up misconceptions and provide the answers you need. Throughout our articles we will be using a 4 ton unit as our example unit, along with a 4” supply and recharge well. Well capacity (how many gallons per minute it will produce)? How many gallons per minute do you need for both domestic water AND your geothermal unit? Size of your existing pump? Speaking of recharge wells, the water that comes out must go back. As easy as it sounds, replacing water back into a well can be risky. While the majority of recharge wells we have drilled here on the Peninsula have worked successfully, there are enough that have refused to accept the water back that we had to note this in our major concerns list. Sometimes even drilling an additional return well does not correct the problem. This is especially critical to note since Delaware and Maryland laws mandate how the water must be returned, so if you have no functioning return well, you will not be permitted to have an open loop system. While open loop systems can be a great choice for new home construction with well needs, it is critical to get feedback from your well driller on your property location and whether it is within an area that has shown a minimal amount of issues for open loop systems.